The story starts when Sammi loses custody of her child, QQ, because she got nailed by one fateful question posed by Mark, her husband's lawyer, who questioned her ability to look after the child. Sammi was wallowing in self-pity for a while, until her good friend Xianghui brought her back to her senses. He helped her turn her life around. Sammi started to work hard to fight back her custody of the child. Sammi joins a law firm where she meets various lawyers with different unique abilities. There is the buck-teeth Joe, who has a vast knowledge of the law, the elegant Martha who has an attitude problem, and finally, her nemesis, Mark. She is peeved when she is made Mark's personal assistant. Meanwhile, other characters begin to unfold in the series. They are Deputy Public Prosecutor Tracy, Mark's ex-classmate who has an unhappy past; CT Guan, the mentor whom Mark bears a grudge; Toby, Sammi's best friend; Mark's mother; QQ and Sammi's ex-husband. A complicated network of love relationships begin to weave and entangle between the characters. Relationships are broken and then mended. Old flames rekindle their love. Misunderstandings arise and hurt all parties involved. The cast was simply outstanding. There was a lot of chemistry between the characters; even more so between Hacken and Kenix. The storyline was skilfully crafted out so that every idea is brought across clearly. 22 episodes was indeed sufficient to bring out the full essence of the story. The characters were splendid in their acting. I could feel myself present in the courtroom listening to the lawyers' individual testimomies being read out to the judge, especially Kenix's final testimony in her fight to gain back her custody of QQ. It was so full of emotion that I could feel myself literally crying with her. The only probable bad aftertaste in this series is that it had two different endings. Though TVB wants to make this series unique so that the viewers could see the two opposite outcomes of the endings, I believe that it was uneccessary. It only confuses the viewers as to what happens finally. I believe that TVB should stick to the "classic happy ending" for this series. Is it abit too late to start this topic?Cuz this show was produced in like 2002 i think.But I love this show and I carn find a thread on this show so I decided to start one.Anyone watched this serial before? This show is quite an old show but it's good.Nice to see hacken acting again and he has quite good chemistry with Kenix.The cases were interesting and the development of the story is good.Worth watching!!! I love this series. Great characters and interesting plot development. I also thought Kenix did a good job and a different than her usual strong woman type. She was convincing portraying a mother who misses her son badly. Kenix and Hacken also had good chemistry. The supporting cast are great too and actually think Hacken is the weakest of the 4. Michael stole the show and Elaine was pretty good too. The ending was weird though with Kenix's son rewinding and then ends with Kenix and Hacken together. Well, at least this ending is better than the one in the Special that was made after this series was over. I hated that ending and pretend it never happened. I love the cases from these show...but I don't really like the casts.However,they made this show really interesting and exciting!! i loved this series. i still watch it when i have nothing else to watch. but the ending seemed kinda rush tho. This series was a long time ago. At the time i liked it a lot, exp the main theme song by hacken lee. Come to think about it, all the cast here have become a lot more famous- i dont even remember where did myolie turn up in. All i remeber was the funny bits of michael tse and the really professional look of Patricia. I didnt like the pairing of kenix and hacken - maybe it was due to the DIF. Yes the plot was pretty good. But i dont know if i will still lvoe it as much as before. i remember this show!! when it first came out, it was really really good ratings. i have to admit, kenix and hacken make an odd couple. you don't usually picture those two getting together. nonetheless, pretty good series. hahah! i remember this show very clearly! i liked joe & martha. they were very funnaye. LOLs. i thought the ending was a bit confusing though. shek was a lawyer in the show right? myolie...i remember her but i don't know what her role was. & stephen! was he even in the show? xDD don't have much impression of him in there. & ah, i'd like to see more shows with elaine la. Bah who is this person again i forgot her name, she was in Legal Entanglement too as one of the workers in the office. I got her autograph but forgot name. Also this was a good series, "I Love You" song was good. Edited by Blueboy, 26 April 2007 - 11:20 PM. I miss Hacken in TVB series, too bad I think this is one of the last ones he was ever in. I even remember he did an MV of another ending to this series about QQ, it was several parts. Not sure what it is called though. This is one of my favorite Kenix series, she plays the role of a lawyer really well and trying to rebuild her life after her player husband is fooling around with her bridesmaid when she is pregnant. QQ was so cute with his love for candies. This was one of Michael's best series, he plays the guy with the buck teeth that stick out. The girl who played Martha did a good job too. My favorite part was when michael proposed to her in the courtroom and sang that english song. 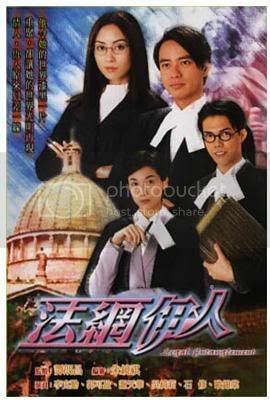 I'm sure everyone remembers the confusing ending, what if Kenix become an attorney or what if she left with Hacken, who knows it is up to our imagination:) A great series for anyone in the mood for a lawyer flick. this was a good series, i wonder why tvb hasnt replayed it. A lot of people were confused, I guess it's up to your imagination, kenix's son could have been fast forwarding regarding his mom becoming a lawyer or could just mean that kenix did in fact go after hacken. I want the latter of course, since she is so much more happier, she wants love more than a career anyways.